Despite the many regulatory changes healthcare providers faced over the course of this year, none was as highly anticipated as ICD-10 implementation. While industry leaders predicted the transition would cause significant operational disruptions, increased technological demands and cash flow interruptions, publications like Modern Healthcare were already describing the event as “like Y2K” just 12 short hours after the go-live date. 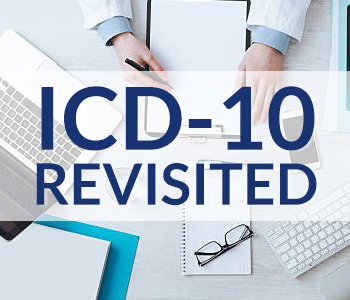 And yet, after the first month using ICD-10, the Centers for Medicare and Medicaid Services (CMS) reported that claims were processing normally, with 10 percent of total claims being rejected and .09 percent of claims being rejected for invalid ICD-10 codes. However, not all escaped the transition unscathed. Of the healthcare organizations surveyed by Primeau Consulting Group in the final months of 2015, 66 percent of respondents reported “some negative changes” in coder productivity, with some participants noting a 25-35 percent decrease in efficiency. While many groups have completed additional training and ironed out the kinks in their coding processes, the changes are just beginning. Earlier this year, the Centers for Disease Control and Prevention (CDC) released nearly 2,000 diagnosis codes to be added to the ICD-10 coding system effective Oct. 1, 2016. This brought the total number of diagnosis codes to 71,486. The majority of these new codes are related to blindness and vision disorders, ectopic pregnancy, laterality, injury and fracture coding. Starting this month, however, the agency will be seeking greater specificity in the ICD-10 codes submitted. As such, healthcare providers should avoid unspecified ICD-10 codes “whenever documentation supports a more detailed code,” CMS’ newly released guidance stated. “Check the coding on each claim to make sure that it aligns with the clinical documentation. While you should report specific diagnosis codes when they are supported by the available medical record documentation and clinical knowledge of the patient’s health condition, in some instances signs/symptoms or unspecified codes are the best choice to accurately reflect the healthcare encounter. You should code each healthcare encounter to the level of certainty known for that encounter.” There will be times when an unspecified code such as Migraine Headache Unspecified (G43.909) is the appropriate and correct code to report for the encounter. Understanding that not all unspecified codes are considered inappropriate to report will be key in the coming year. These changes may affect physician specialties differently. For example, radiologists must ensure referring physicians are providing complete and detailed clinical histories when ordering imaging services. According to the American Hospital Association’s (AHA) Coding Clinic and the American College of Radiology (ACR), it is inappropriate for referring physicians to submit ICD-10 codes in lieu of a detailed clinical history when ordering imaging services. It is the responsibility of the rendering provider to assign the appropriate ICD-10 codes based on the documentation in the dictated report or medical record. For more information regarding ICD-10 coding, compliance and upcoming changes for 2017, please send me an email at Cheryl.Loper@IntegratedMP.com or give me a call at 414-359-5724.